I doubt it would shock anyone to find out I tend to be an organized person. I like having a plan. I like setting goals. I like working towards my goals. These things bring me satisfaction and often allow me to manage huge projects without them becoming completely overwhelming. So, when I worked out my plan for the Dames and Dandies back in December, there was a checklist of things I wanted to draw for each of the poses. One of those things for the dandies (or gents, as I sometimes think of the C pose) was a tuxedo. I wanted to do a suit (which I did back in July), so next up on my list was tuxedo. Why a tuxedo? Because C Pose guys might need to go to a formal event. And everyone needs a tuxedo. Well, what do you think? A big fan of the tuxedo? Not sure about the white dinner jacket option? There’s a plain black version on my Patreon page for my Patrons. Meanwhile, check out my 100 dresses project over on Instagram. It’s nearly wrapped. I’m on dress 97! And do let me know what you think of today’s tuxedo in a comment! Hearing from you guys is always super fun for me. 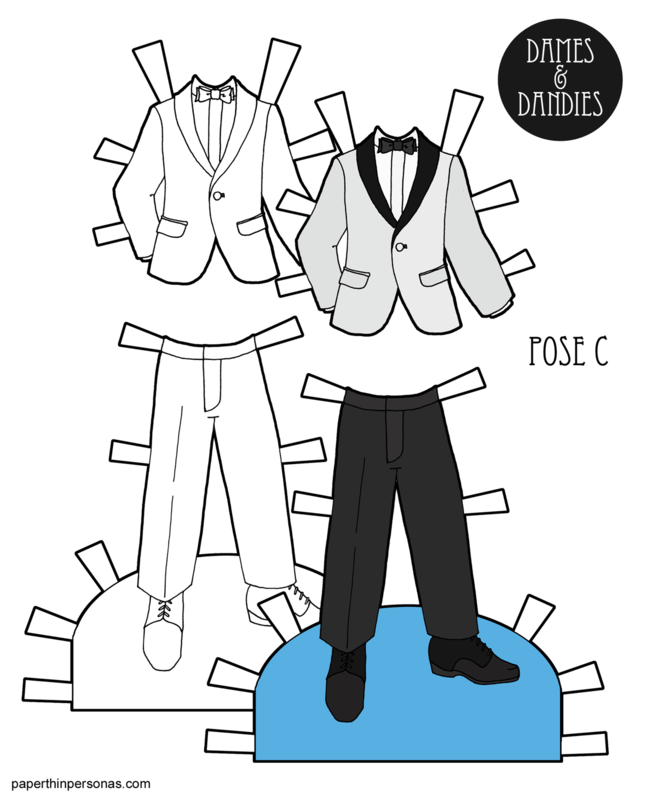 Printable Black & White PDF Printable Color PDF More Paper Dolls & ClothesI wanted to draw a suit for the C Pose Dandies of the Dames and Dandies paper doll series, because I think a suit is just a basic piece of clothing every person (male or female) probably needs. Most of us don’t wear them daily (though I would if I could), but I think a good suit is handy. It’s great for dates, cocktail parties, weddings, job interviews or just because you want to feel dashing. There is nothing quite as dashing as a well cut suit. As my mother is fond of saying, “A well cut suit can hide a multitude of sins.” So, any man (or paper doll man) needs a good suit. Plus I find drawing men’s suits a little intimidating, so it is good practice for me to work on them. In fact, both a suit and a tuxedo (which I haven’t drawn yet) were on my initial brainstorm of paper doll clothing “basics” that I thought I needed for the gents. That original list also included pirates and post-apocalyptic, so I have gotten a lot of it drawn. Despite my best efforts, the C Pose boy paper dolls still trail behind the ladies in numbers of sets. I just can’t help it. I like drawing ladies clothing more than gent’s clothing. Well, what do you think? Are you a a fan of suits? Hate them? What else do does the well outfitted paper doll man need? Let me know in a comment. I love to hear from you. 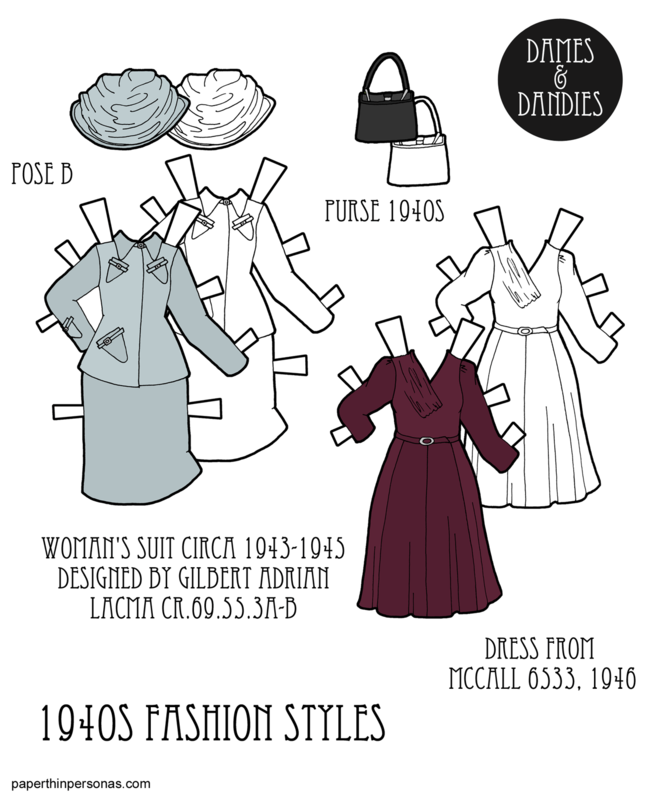 Printable Black & White PDF Printable Color PDF More Paper Dolls & ClothesI grew up in Alaska. And if there is one thing that is true about Southeast Alaska, it is a super green place. There’s so many trees and foliage and moss. It’s as though the whole forest is shades of green. Among all these mounds of different green things, there were many ferns. I grew up referring to most of the ferns as fiddlehead ferns, only to learn recently that there are several species that have that common name. The “fiddlehead” of the fern is the coiled part that develops as the fern is growing. I wanted to design a men’s suit to go with all the floral theme, but I couldn’t think of a masculine flower. So, instead I found myself reminded that the top a fiddlehead fern looks a bit like the top of a cane. 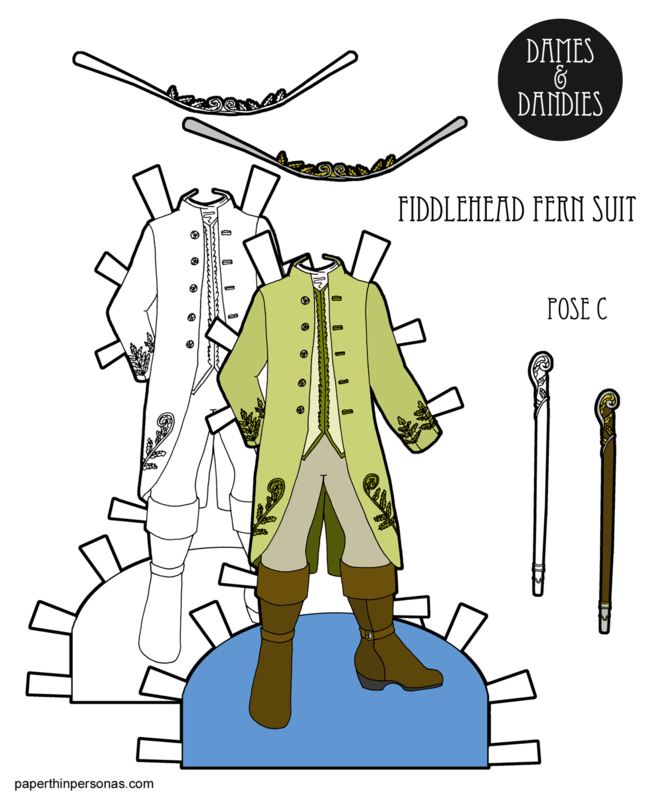 Once that occurred to me, today’s 18th century inspired men’s suit for a paper doll prince was born. It’ll fit the C Pose paper dolls, FYI. Yeah, I confess my brain works in strange ways sometimes. The fiddlhead ferns trim his cutway coat, decorate the cane and his crown. Full blooming ferns decorate the sleeves. The shapes on the edges of fern leaves echo the trim on the vest. The colors of ferns inspired the green color scheme. I mean, I could hardly make a “fiddlehead fern suit” and then turn it bright red. Also, I should add, that fiddleheads are edible and are quite tasty sautéd with butter and garlic. On the other hand, what isn’t tasty sautéd with butter and garlic? I think I would eat shoe leather if it was covered in enough butter and garlic. This suit was designed, of course, for the C Pose dandies and goes with yesterday’s lily ball gown. I don’t draw a lot of prince paper doll clothing, so I had fun designing this suit and crown for a paper doll prince, or king, I suppose. 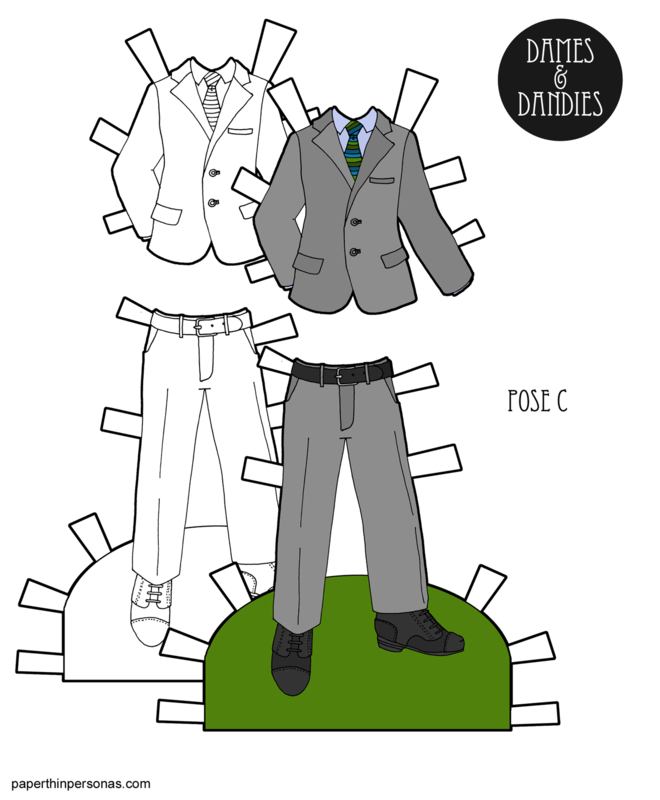 Today’s Printable Paper Doll Inspirations: Suits! All the Suits! 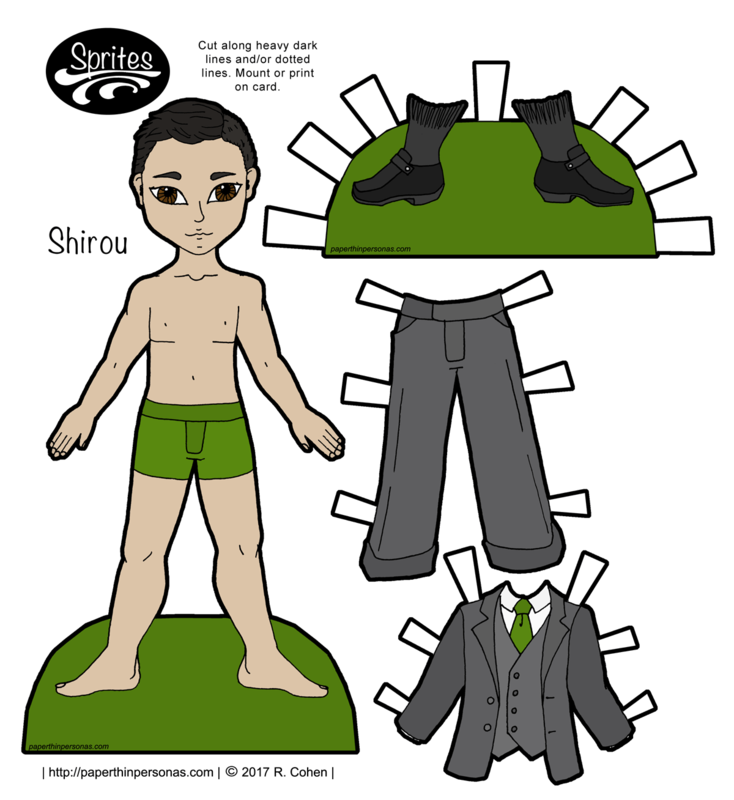 While my second doll ever in the Sprites printable paper doll collection was Yumiko, I haven’t done an Asian guy yet for the Sprites and I wanted to do that today. I am pleased to introduce to everyone Shirou. Shirou is a Japanese name which means Fourth Son. It’s traditionally given to the, wait for it, fourth son. I though it was super fitting, because Shirou is my fourth male Sprites paper doll. The others are (in order of “birth”) Zachary, Xavier and Víctor. Back when PTP began, I was petrified of trying to draw Asian features. Mostly, it was the epicanthic fold that worried me. I was also self conscious that, as a non-Asian, I didn’t want to draw a caricature. While it has taken me a long time, I’ve gotten pretty comfortable with the whole epicanthic fold thing and come to realize there is huge variation in this feature. See, more then you wanted to know about the epicanthic fold. So, what do you think of today’s Sprite paper doll? Let me know in a comment. I love hearing from you all. Want to help keep the blog on the internet? Donate on Patreon. Oh, and tomorrow, there will be another installment of the Poppets 1920s series and on Friday, come around for the next piece in the 2017 Collab paper doll project. 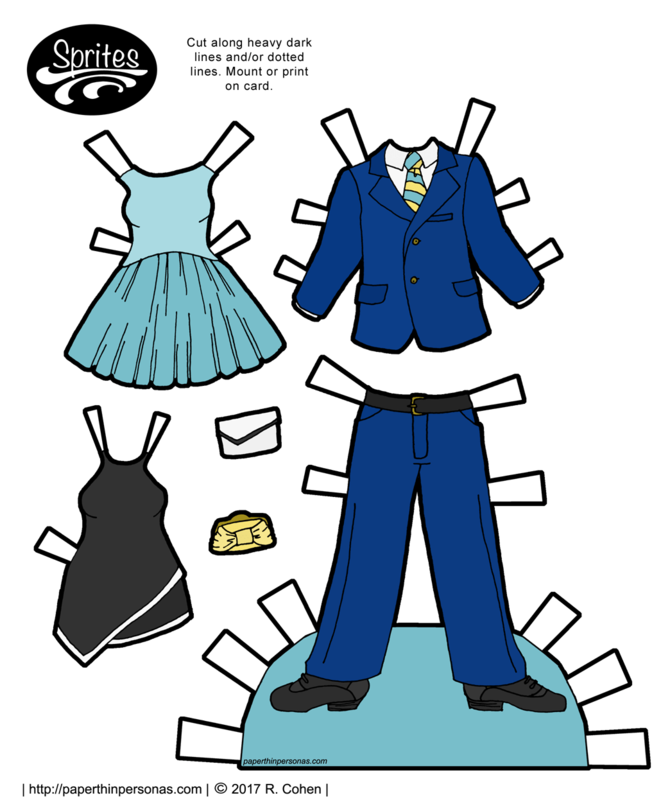 Today’s Printable Paper Doll Inspirations: Suits! It seemed past time to me that I should share a new Sprites face. Today I am pleased to introduce Teresa, the newest member of the Sprites printable paper doll family. In my head, she’s a Latina paper doll, but her skin-tone and coloring could be from a variety of places. The name “Teresa” is Spanish and is one of those names where the meaning is a little unclear. It has been the name of several Catholic saints though and I’ve always had a fondness for it. I’ve been wanting to create a printable paper doll set with suits, so today Teresa has a beautiful grey suit. I chose grey for the suit, because I love grey suits. I think it would be beautiful in a color as well. Maybe a strong purple or soft blue would look really nice. Her shoes either match her purse or are meant to be nice basics. They do have pretty high heels… but then I love a good pair of high heels. Oh, and tomorrow, there will be a new guy paper doll to be added to the Sprites paper doll family. I’m super excited to introduce him and his dashing suit.